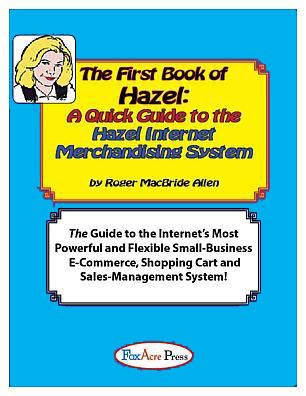 The First Book of Hazel: A Quick Guide to the Hazel Internet Merchandising System. Printed with the main text in black-and-white, with code examples, images and diagrams in color. This version includes the pages of the book only, without the binder. It's for all of us who already have stacks of three-ring binders around the house already. (Why spend extra buying and shipping the binder you already have?) The First Book of Hazel: A Quick Guide to the Hazel Internet Merchandising System in a three-ring binder with front, back and spine inserts. Printed with the main text in black-and-white, with code examples, images and diagrams in color.